Carbo Ceramics, Enbridge Energy Partners, and Cheniere Energy all made double-digit moves this week on the heels of updated outlooks. It was a relatively benign week in the oil market, with crude prices closing basically flat from the prior week. That said, not every stock behaved calmly this week, with several moving double digits due to a variety of company-specific catalysts. Leading the way, according to data from S&P Global Market Intelligence, were CARBO Ceramics (NYSE:CRR), Enbridge Energy Partners (NYSE:EEP), and Cheniere Energy (NYSEMKT:LNG). CRR Price data by YCharts. Fueling CARBO Ceramics' big surge was its fourth-quarter results. The proppant maker reported $29.1 million in sales for the quarter, which was up 44% from the third quarter, thanks to a 41% jump in ceramic sales volumes. While revenue was still down 49% year over year, it came in $4.5 million ahead of expectations. CARBO's net loss also came in well ahead of the consensus estimate. Meanwhile, CARBO's CEO Gary Kolstad offered a very promising outlook in the earnings press release. He said that the company is "optimistic that the operating environment for CARBO will continue to improve in 2017. We anticipate both oilfield and industrial technologies to see strong double-digit sales growth year-over-year." That has investors breathing a huge sigh of relief that the company's troubles appear to be in the rearview mirror. LNG exporter Cheniere Energy also rallied sharply this week on an optimistic outlook. That's after Reuters reported that LNG projects in Australia continue to face big delays, which should benefit both Cheniere Energy and ExxonMobil. Three of Australia's major projects, Prelude, Gorgon, and Ichthys, will not begin exporting until next year, or even later, due to a series of significant delays, which should enable Cheniere Energy's Sabine Pass and ExxonMobil's Papua New Guinea facilities to sell more LNG at higher prices. 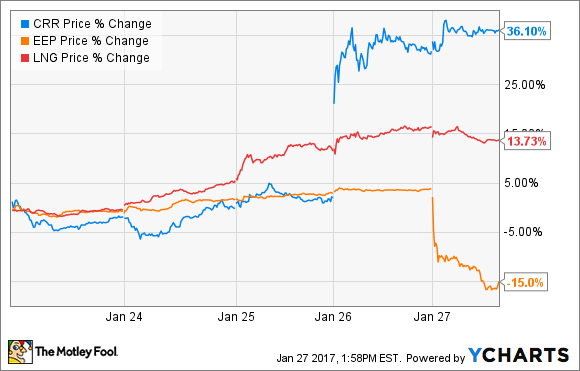 Finally, Enbridge Energy Partners (NYSE:EEP) plunged this week after revealing its guidance for 2017. The company said that distributable cash flow would decline from a range of $860 million to $920 million in 2016 down to a range of $750 million to $800 million this year. Driving the decline is lower commodity prices, which is hurting the company's volumes and price realizations. Further, the company's parent, Enbridge (NYSE:ENB), announced this week that it would acquire all the publicly held units of Midcoast Energy Partners (NYSE:MEP), which is an MLP controlled by Enbridge Energy Partners. Enbridge also noted that it continues to evaluate its options for Enbridge Energy Partners. These announcements have investors worried that Enbridge Energy Partners will need to cut its distribution significantly to improve its financial situation because Enbridge made it clear that it intends to leave its MLP as a stand-alone entity. Because the market is forward looking, it tends to focus more on a company's outlook than its current results. As a result, traders often bid up or sell off companies based on what they think future results might be. However, because the market has a history of overreacting, especially to the downside, investors should use the week's sell-off in Enbridge Energy Partners as an opportunity to take a closer look.